The food desserts that are America’s inner cities are also the site of some of America’s poorest communities and most at-risk youth. By creating urban-based agriculture programs that focus on strengthening community ties and encouraging self-sufficiency, Garden City Harvest and its four urban farms: River Road Farm, Orchard Gardens Farm, Youth Farm and PEAS Farm, are doing their part to create a level playing field in the world of food security and second chances. 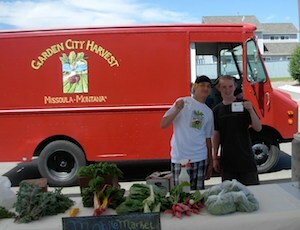 Garden City Harvest is a Missoula based nonprofit returning this Montana town back to its community gardening roots. Garden City Harvest offers a plethora of opportunities. Programs include internships, field trips, agriculture based curriculum, lessons in cooking and gardening for school aged children and their teachers. They offer plots at community gardens for families and classes in agriculture. All the farms provide produce for area food banks and a therapeutic employment environment for older teens looking for mentors, direction and civic involvement. The majority of the teens in the youth development programs are there by court appointment. Creating partnerships with area agencies and the larger community is part of the Garden City Harvest objective. Josh Slotnick is a professor of environmental studies at the University of Montana and one of the cofounders of Garden City Harvest which was created in 1996. Slotnick is the director of the PEAS (Program in Ecological Agriculture and Society) farm, the largest urban farm run by Garden City Harvest in collaboration with the University of Montana. As Slotnick explains, profit is not measured by economics alone. Success is about achieving the threefold mission of education, connecting with low income communities and positive results through the youth based programming, Youth Harvest and the Mobile Market. Take Hannah Ellison. She was a Youth Harvest program member at the tender of age of 17. Working alongside Josh Slotnick and the university students of his PEAS program, Ellison found a connection to the land that sustained her through a relapse into the drug world and came out the other side, or at the end of the harvest, with a new perspective on reality that encouraged her to stay close to the farm and raise her daughter in a sustainable lifestyle. Her story is part of the literature given to the students in the University of Montana’s Environmental Studies program to make them understand that the three mile walk to the PEAS Farm and the at-risk teens they spend their day with is so much more than college credit. For Slotnick, his work with low income communities, at-risk teens and the urban society of Missoula is so much more than a job. It’s about recognizing inequality and doing something about it. “We have all the calories we could possibly want. We are the most gluttonous nation that the earth has ever seen. We have a caste system around the issue of food security. If you are wealthy you can buy fresh fruits and vegetables, if not, you don’t. American poor people are fat. They have diabetes and lower life expectancies than people with money. Food security isn’t about the actual calories but the quality of food. We have a real issue in that not everyone has access to good food,” states Slotnick. PEAS Farm isn’t only a haven for developing youth; it’s also a working organic farm. Utilizing traditional techniques such as cover crops, composting, crop rotation and three year fallow land use to rest the soil. One of the main challenges that the farm faces with the CSA model is market saturation. So far they have managed to maintain their small corner of the urban farming structure of Missoula. 100 shares in a 100,000 population isn’t much, but for Slotnick it’s about the effects of urban agriculture not the numbers. “I think the cultural impact is really huge. It’s a very public farm; everyone knows about it. We have an annual party and 750 people come to our party. I think the farm is a sort of bellwether that lets people know where we are in the season and serves as a reminder of where we are. That this is its own special place and it’s not just like every other place,” explains Slotnick. Josh Slotnick has a degree in philosophy, worked with the Peace Corps in Thailand, studied horticulture, attended Cornell and wrote his Master’s thesis on urban farming. It was the catalyst for the creation of Garden City Harvest. With a lot of other hard working people, the farms, community gardens and outreach programs became a reality. “I think urban agriculture right now plays a really powerful role in giving people meaning in their lives. Our farm serves to attach people to their place and to their communities. Urban agriculture is way, way more than food. It’s not really about food; it’s about people doing something meaningful with their time and with their place. The food is just like the icing on the cake. In a more perfect world I’d love to see small farms everywhere,” concludes Slotnick. Garden City Harvest began as one community garden and a two acre farm. Today, there are seven community gardens, four urban farms and programs for every age group. The Missoula County Public School District leases the land to the city who in turn leases it to Garden City Harvest, reflecting yet another community collaboration that is essential for the nonprofit urban agriculture infrastructure.